Allergy season is here and you might notice that the people in your household are sneezing and coughing a little more, particularly with the recent pollen drop. Changing the air filter may help to alleviate allergy symptoms, which is part of why we recommend doing so each month or so. But did you know that this serves a different purpose when it comes to the state of your air conditioning system? 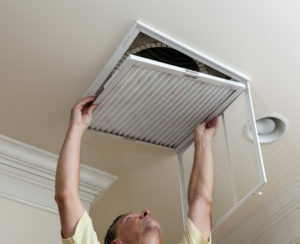 Changing the filter also helps air flow through your air conditioner with ease and prevent sudden system failure. You feel less comfortable or the air quality in your home diminishes. The air conditioner struggles to run, increasing wear and tear and leading to potential system breakdowns! Changing your air filter every month can help prevent the above issues. Just set a reminder on your phone if that makes it easier. One other major step of maintaining a home’s air conditioner is cleaning the coils that reside in the outside unit of your system. These coils are responsible for the release of heat as it dissipates from refrigerant condensing in the coils. Refrigeration is a process of heat exchange, and that’s how your split-system AC cools your home. When the coils outside are dirty, heat cannot be released into the air, which causes some of the same problems as a clogged filter (and may also lead to water leaks in the home!). Ask us about our annual Sirius Comfort Care program to learn more about preventative maintenance. …and much more! All of this can help to prepare your air conditioner for warm season and help reduce the possibility of system failure, restore energy efficiency and lower bills, and stay more comfortable all spring and summer long. For an AC tune-up in the Dallas, Texas and Ft. Worth, Texas metroplex, contact Sirius Plumbing and Air Conditioning today.